Pack your bags, grab your passport and ask your neighbour to feed the cat; we're going on a blog tour! 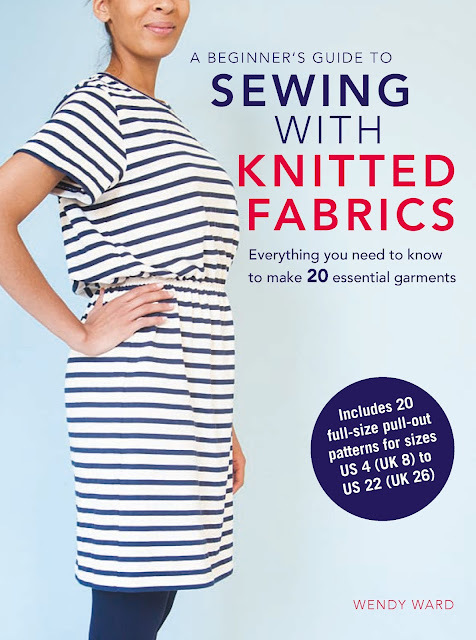 Wendy Ward (my IRL boss, FYI), has written another fabulous sewing book, this time all about sewing with knit fabrics. As well as MASSES of information about choosing and working with knit fabrics, this book includes graded sewing patterns to make 6 basic projects with heaps of additional variations. The pattern pieces are printed on the three double-sided pattern sheets at the back of the book. It didn't take me long to decide on the Kinder cardigan pattern to try out. The weather can vary a lot during one day in the UK, plus I'm usually feeling cold anyway, therefore I have a deep appreciation for a good cardigan for layering up. 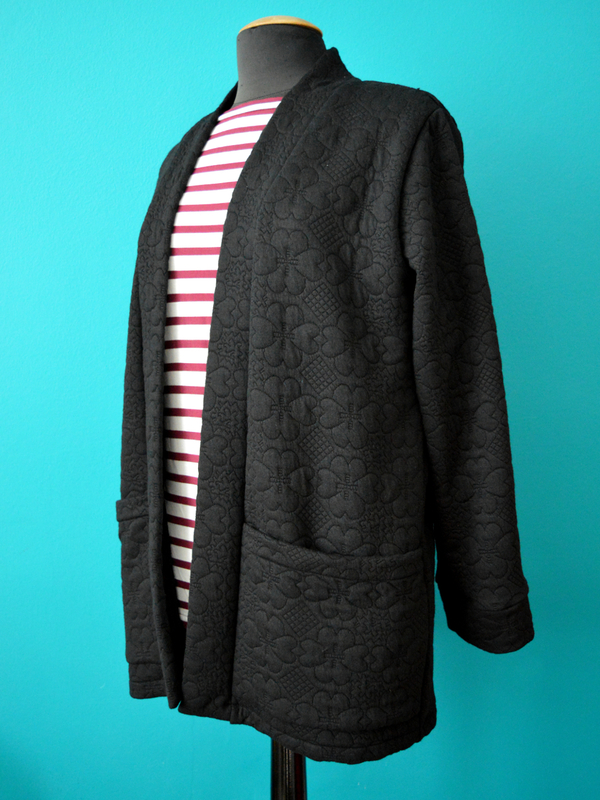 The kimono-style Kinder cardigan pattern includes three lengths (short-, mid-length and full-length), two sleeve lengths, optional cuffs for the long sleeve length, AND optional pockets for the mid- and long-length cardigans. 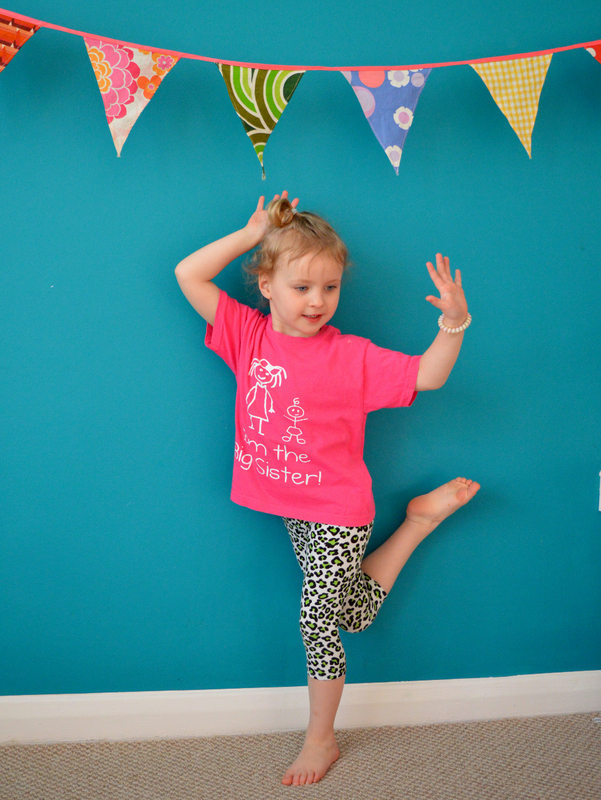 Having chosen the design elements you want, you then need to trace the pattern pieces off the pattern sheets. Tracing the pattern pieces off was probably the most time consuming part of this project. Because most of the Kinder cardigan pattern pieces are larger than the pattern sheets included in the book, most of them are extended over a couple of sheets. It was a bit annoying that all the cardigan pattern pieces were spread over all six sides of the pattern sheets, rather than all located on one sheet, but I'm sure there was a spacial/financial reason for designing the pattern sheets in this way. Confession time: I messed up the tracing. 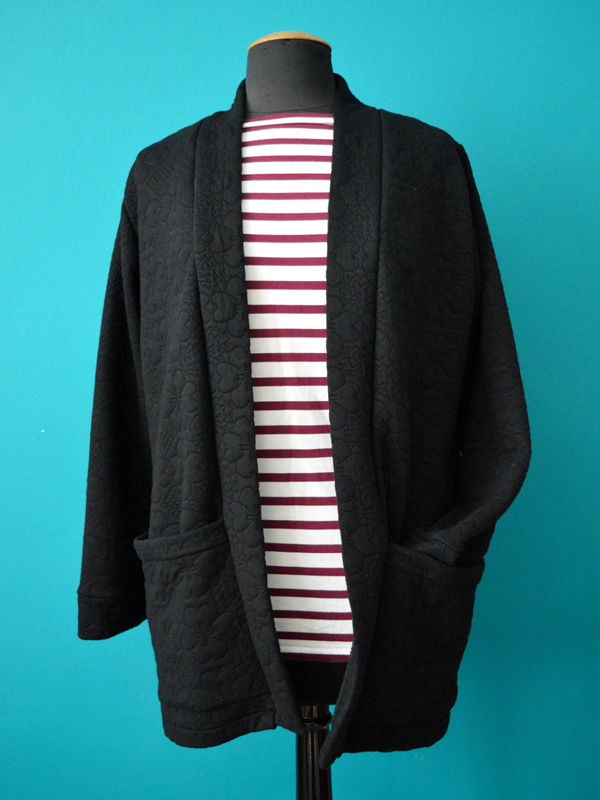 I was aiming for the mid-length cardigan, rather than the short length that you see here. I got confused and read the 'hip line' that is marked on the pattern as the hip-length hem line (duh), and didn't realise what I'd done until I started construction so ended up making the short length instead. Entirely my fault. 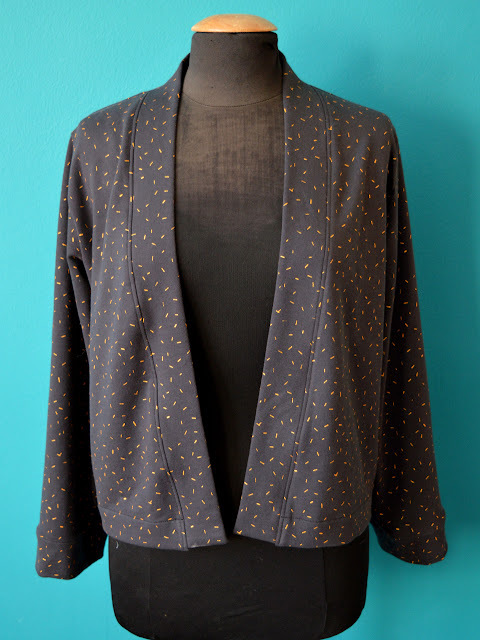 Anyways, after that blip, this cardigan came together in the blink of an eye. It would be an excellent confidence-building pattern for a beginner sewer/sewist, and a satisfyingly quick make for a more experienced one. 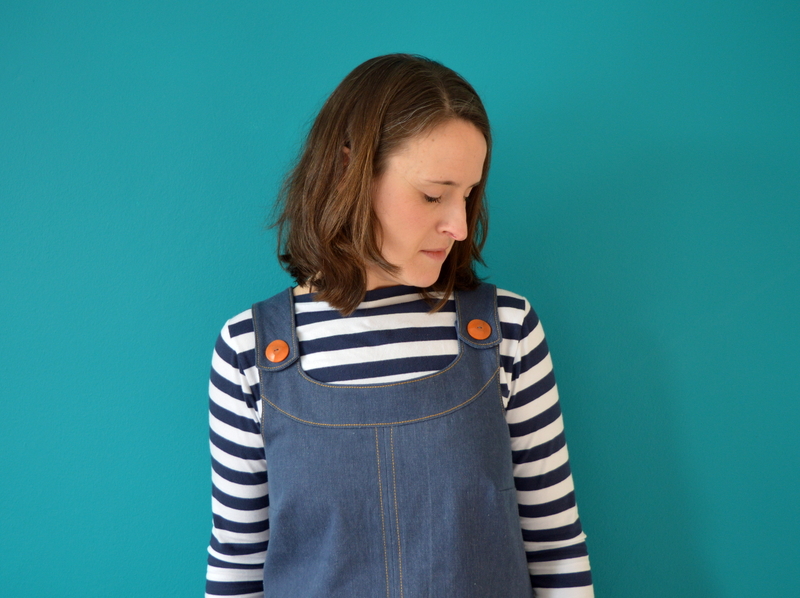 For this review, I was lucky enough to be able to choose what fabric I wanted to make it in from the massive selection on the Minerva Crafts website. Queue: hours upon hours searching through their site. Eventually I requested some Atelier Brunette sweatshirting, annoyingly I can no longer find it on their site so I'm guessing they've sold out, but they do have this slightly different design in alternative colour-ways in the same weight. I've seen these Atelier Brunette sweatshirt fabrics used on blogs and Instagram many times before but couldn't really justify shelling out £20+ a metre for sweatshirt fabric myself. But now I have had the opportunity to feel, work with and wear it, I can totally see what all the fuss is about and why it is so special. My goodness it is soft and lovely, and washes really well without the sparkles coming off. So after making and loving my first version, I knew I wanted to make another, and fast. 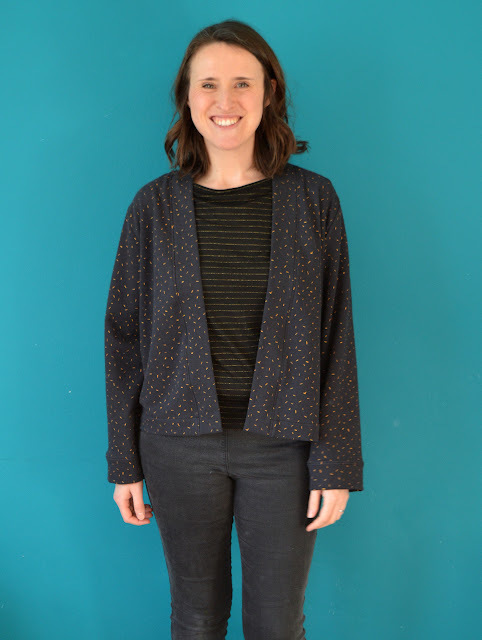 I found this lovely quilted/embossed ponte de Roma at Fabric Godmother at their recent open day, and I can't recommend it enough for making a snuggly cardigan like this. Having found the right fabric, I then went back and traced the *ahem* correct length pattern pieces for the mid-length cardigan, and two evening sewing sessions later (one for cutting, one for construction), my new favourite garment was complete. This post is the first stop on the 'A Beginner's Guide to Sewing with Knitted Fabrics' blog tour, and there's some other fabulous sewers lined up along the way. 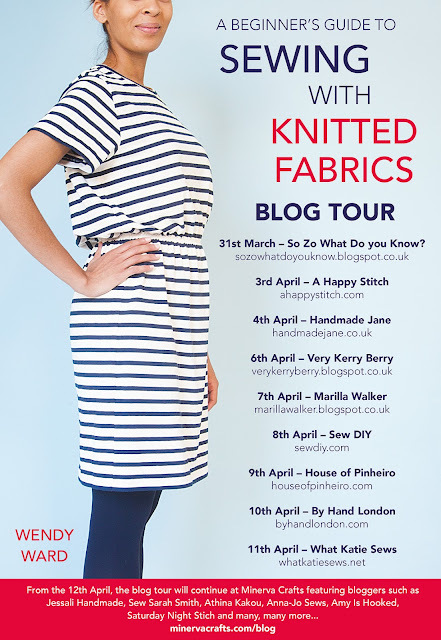 I have been provided with the handy image below (handy for me because it means I don't need to type them all out) to show you when and where else you can see Wendy's new knit patterns in action. If you like what you see and fancy snapping up a copy of this book, then MAKEetc.com are offering a sizeable 25% off the price by typing in the code BLOG25 at the check out until 21st April. Cards on the table: I'm not feeling great about my body at the moment. Winter eating patterns (AKA eating EVERYTHING), having had two babies, as well as entering my late thirties all seem to have taken their toll recently and I'm not feeling at all comfortable. I'm hoping that improved eating habits and adapting my expectations will meet in the middle and I'll feel happier in the near future. But in the meantime, I thought it best to make myself a stretchy, tight fitting garment to wear and get photographed in, then share those pictures on the internet. Behold: my new Urban Farmer look. 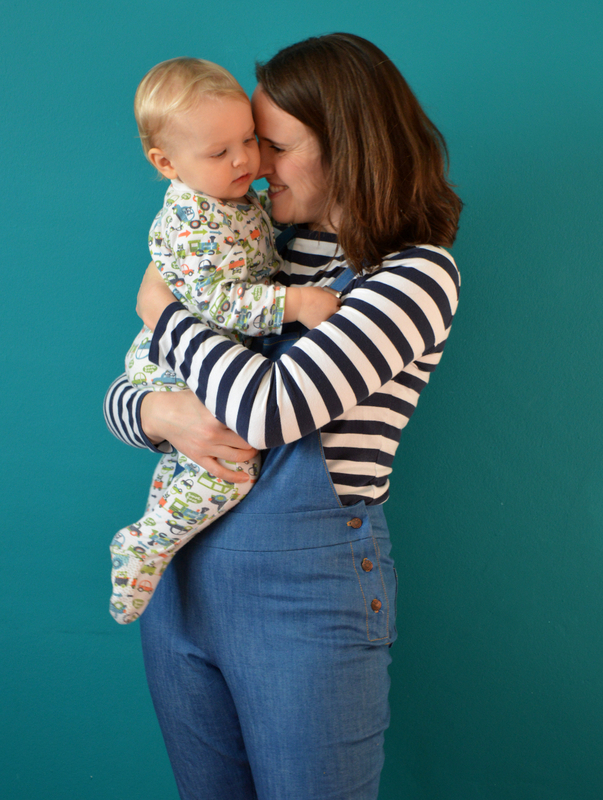 Like many I don't doubt, I was instantly drawn to the Mila dungarees pattern. I love wearing jeggings (despite all the hassle they've given me) and I hoped these would be a fun and interesting alternative. Tilly was kind enough to send me a copy of the pattern, so I made a special pilgrimage to Fabric Godmother (more on the fabric in a bit) and set to work. I cut the TATB-size 4, and made a couple of small changes. Firstly, I re-drafted the curved edge of the bib piece so that it finished a bit closer to the side seam. And secondly, I spent quite a bit of time making tiny tweaks to the fit of the legs to get them looking balanced all the way down. I could easily have lopped off a few centimetres from the leg length, but I've made too many pairs of jeans and trousers that have ended up annoyingly short after a few washes, so I'm keeping these a bit long as I expect they may do the same. The fit-tweaking aside, I found the process of making these sooooo much fun. Working with a well behaved denim and doing all that tidy topstitching was heaven. 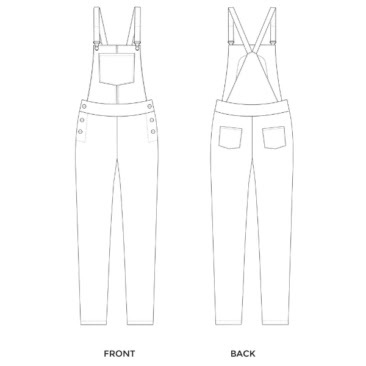 If I were to make them again, I might even add some extra topstitching to the waistbands or crotch seam, as the topstitching is currently largely concentrated on the bib area. Despite some stunning patterned versions popping up on IG, I knew I needed to keep my pair solid. And it had to be denim if they were to become the alternative jeans/jeggings that I hoped they would. 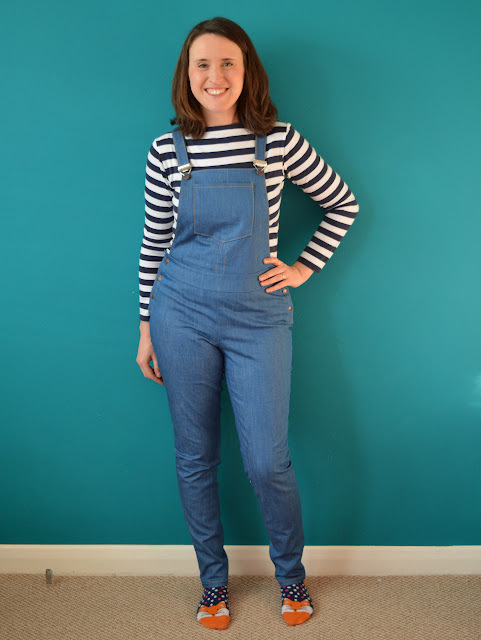 I can't find this denim on the Fabric Godmother website right now, so you'll have to go with my title: fabulous-quality mid-blue stretch denim. I always associate this colour denim with the 1970's, and I adore how it looks contrasted with orangey-gold topstitching thread. 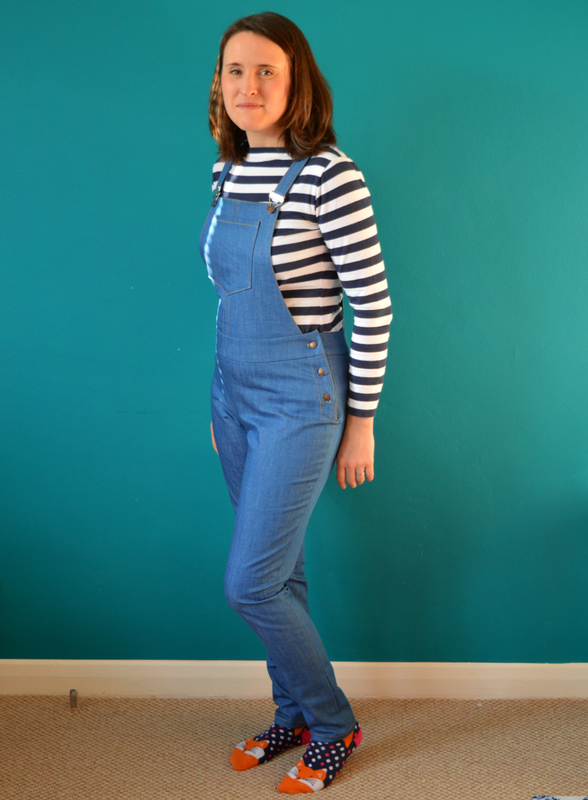 I must admit, there is a part of me that is regretting not making these dungarees in black. But having made my Cleo pinafore in black, I felt my wardrobe would welcome a little variety. Let's talk hard wear. I was sent the buckle set that Tilly stocks with the pattern, and I ended up using the clips combined with these antique copper jeans buttons. Fabric Godmother also stocks the smaller 14mm antique copper jeans buttons, which I got for the side fastenings. I think these buttons suit the denim's colour and vintage-y vibe, whereas I feel it would be silver all the way if I made a black pair. As I'm sure you can tell, I haven't landed on a final opinion on these yet. Perhaps I should have made them in black and saved this vintage-y denim for some epic Lander pants? It is, of course, impossible to say. This post is feeling a bit confessional somehow, but I must also admit that the fit around the bum area is not great. I did get Pat to take a pic, but I really didn't feel like sharing that one today. 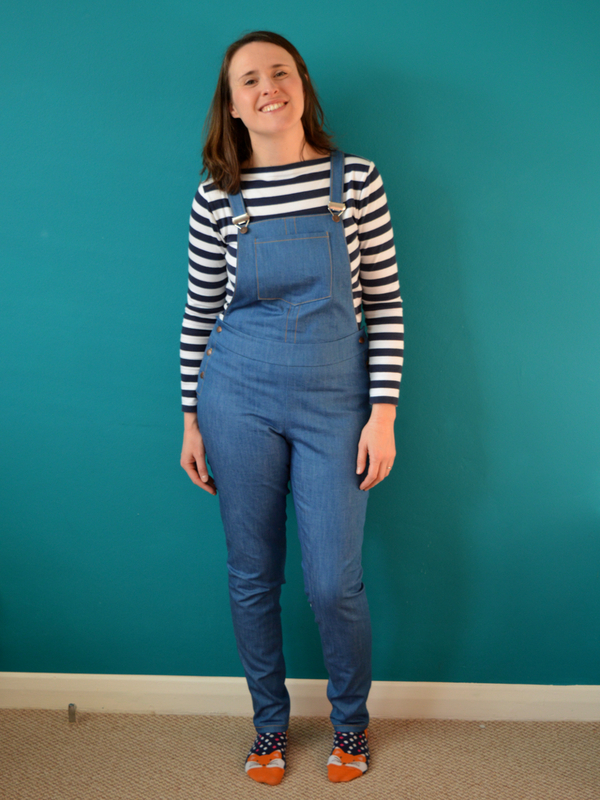 However, I may share that pic with the tutor of The Perfect Jeans craftsy class and get her opinion on what could be improved (as I wrote about in this post). It may be that a bit of scooping could get them looking and fitting better, but I'm not ready to jump down that rabbit hole right now. Busting My Stash. No, Really. I Mean it This Time. 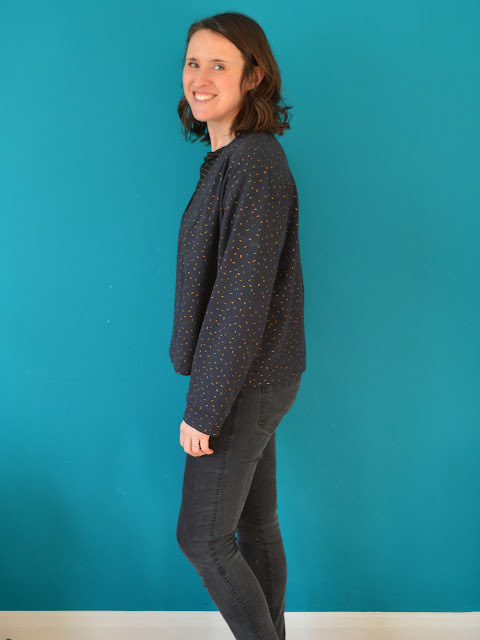 In my recent post about the unsustainability of sewing, I made the argument that it would be difficult to describe sewing as a sustainable activity, and certainly not the most sustainable way to dress ourselves. However, I did go on to list a number of ways in which us sewers/sewists could make sewing more sustainable. Essentially, all of the ideas I came up with lead towards the goal of making clothes that should last you for years because, A) they fit you perfectly and, B) are styles you love to wear that fit with your lifestyle. But in writing that post, I forgot to discuss something else that thankfully the ever-awesome Sarah from Fabric Tragic brought up in the comments: the over consumption and hoarding of fabric. I'm pretty embarrassed to have forgotten to include that topic in my post as it's something I think about A LOT. Like, A LOT. Currently on Instagram there's a hashtag/call to arms doing the rounds called #makeyourstash. It was started by @timetosew and @pilar_bear to encourage sewers to use a piece of fabric that has been in their stash for 6 months or more. They are publishing some accompanying blog posts and initiating stash-related discussions on IG, including recently asking 'what's your ideal stash?'. I think it is a fantastic and worthwhile idea, and by the looks of things, they have already encouraged a lot of people to make stuff from what they already own. 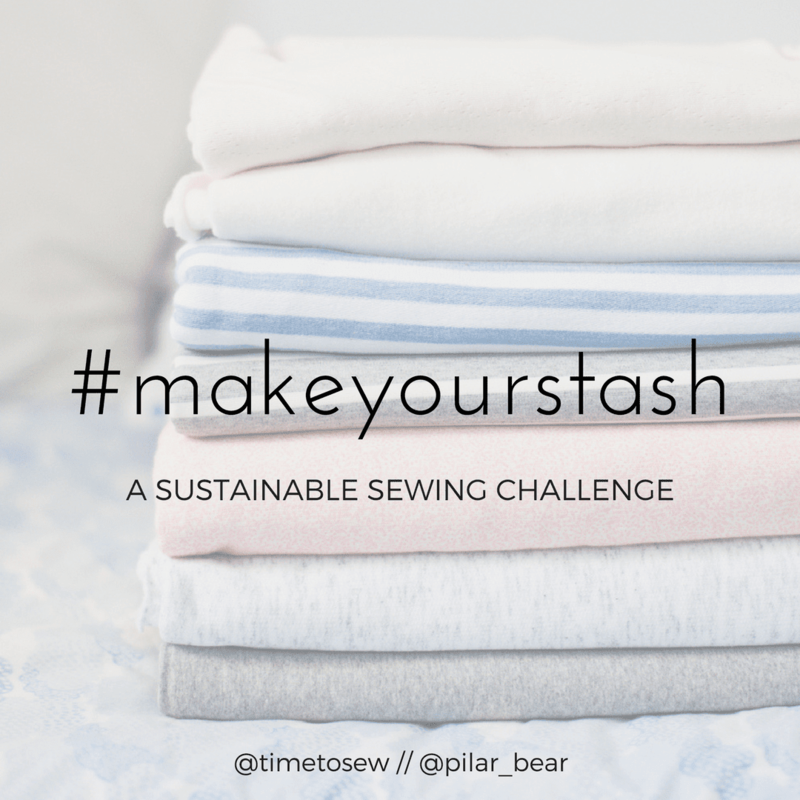 Trying to encourage other members of the sewing community to use their fabric stash is not a new idea of course (and I'm not suggesting that the creators of this one think that it is); there's been a whole host of stash busting initiatives within the sewing community over the years. I even made my own silly little logo a squillion years ago in an attempt to encourage people to bust their stash. But I'm grateful to Kate and Pilar for taking up this mantle again, and doing so with a fresh and accessible approach. I think these are important things to think about and discuss. So what's so bad about having a large fabric stash? Personally, I feel the over consumption of fabric is as damaging as the over consumption of any other manufactured thing. The environment is being irreversibly screwed over, in part because those of us in developed countries can't seem to quench our thirst for new stuff. We've got to slow down in all areas of our consumption, including the fabric us sewers/sewists are secretly, or not so secretly, hoarding. Me? I've got a sizeable stash just like almost everyone else in the sewing community and to me it feels like an uncomfortable amount to own. I'm definitely not sitting here having figured it all out, but I am finally starting to take some steps towards getting my fabric stash under control, and therefore more representative of how I am trying to consume stuff in other areas of my life. So, what am I doing about it? First up, I'm being honest. Towards the end of last year I pulled all my fabric out (again), refolded it (again), and counted what's there. At that time I had about 80 pieces of fabric and about 20-30 refashionable secondhand garments, plus I've already purged my stash of anything I don't like or can't see myself using. Gulp. I've arranged my stash so that it's easily accessible and (mostly) all in one place. Shortly after we moved into this flat about 18 months ago, I got a handyman to come round and build me an extra shelf in our airing cupboard for it to live on. I sorted everything into three sections: wovens, knits and refashionable garments (plus a carrier bag full of lining fabrics and pieces destined for toiling). Now everything is more or less eye level and I can see what's in there with ease. I can remember what I already have more easily because I've seen most of it recently. I must admit that my scraps-and-small-pieces tubs are currently in another room, but once my main stash gets whittled down a bit, I want to put those tubs on that shelf too. I'm only buying/acquiring fabric if I am sure what type of garment (and very often which precise sewing pattern) I want to make with it. A stash busting purist would probably put themselves on a total No New Fabric ban, but I know that that approach would leave me feeling frustrated and uninspired, which is the opposite of how sewing is meant to feel and would negate sewing's benefits to mental health. I did a bit of a personal style-180 a couple of years ago, and without making any additions to my stash, I wouldn't have been able to re-stock my wardrobe with clothes that represent who I am nowadays. Noting down the potential fabric/pattern pairings I've come up with has been essential for getting those garments out of my brain and into reality. Some people use apps like Cora and Evernote or even spreadsheet files to keep track of their stashes. Personally, I have a simple list on my phone which I look at, add to and edit pretty regularly. With a pool of potential projects lined up, it's fun to take a peek and decide which I'm most excited to tackle next, or which garment I'd like to have available to wear the soonest. I like a challenge to give me some momentum, and whilst I DO NOT condone rush sewing or sewing just to use up stash, I have been committed to using up one piece of fabric per week for about 20 weeks now. This idea might horrify some sewers, but I promise that I'm only making things that I really want to wear (or want my children to have) and I'm not skipping on careful project planning and the other steps that will up my chances at creating a successful and long-living garment. I'm confident that, even if my current well of sewing time dries up a bit, I'm on track to get my stash to a size and state that I'm much happier with within a year or so. What about you? Are you happy with your stash as it is? Have you tried, or are you currently trying, to implement ways to reduce it? Or does that sound absurd or counter-productive to you? I'd love to hear your fabric stash-related thoughts. 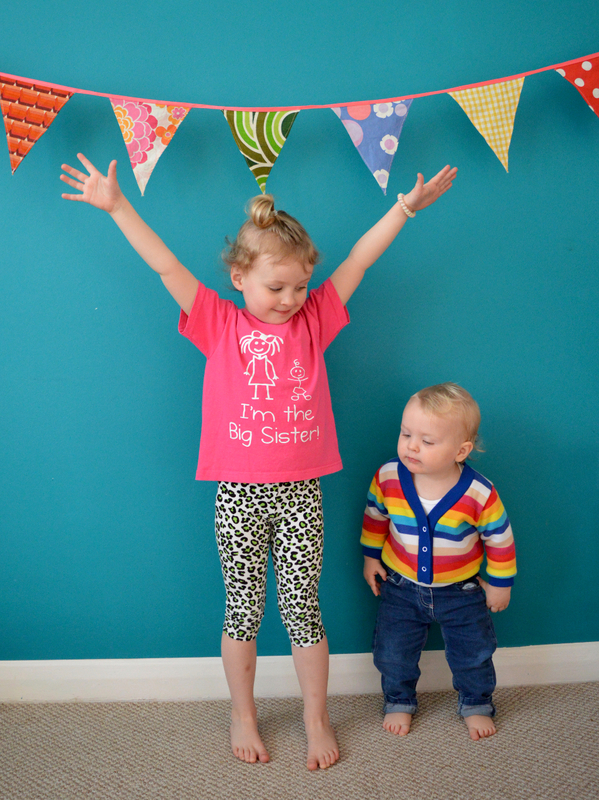 Today I've got another 'look what I made!' blog post for you because I have been sewing A LOT recently. The weather has been horrendous for what feels like months, and my response has been to really hunker down and get my sew-on. I've also made a commitment to myself to steadily turn the contents of my fabric stash into fabulous, wearable garments, but I'll blog more about that soon. 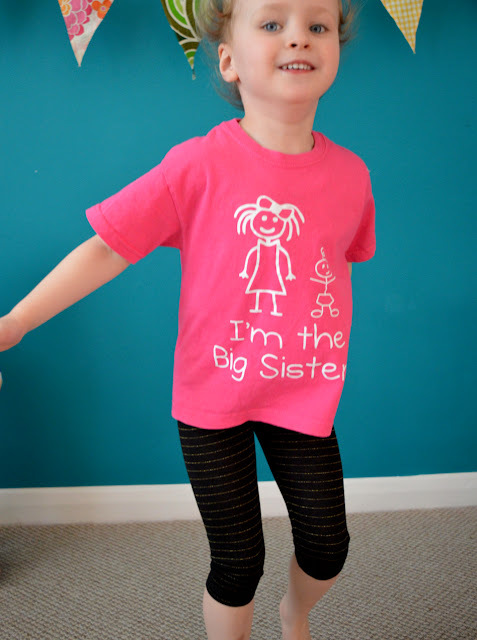 In the meantime, look what I made! 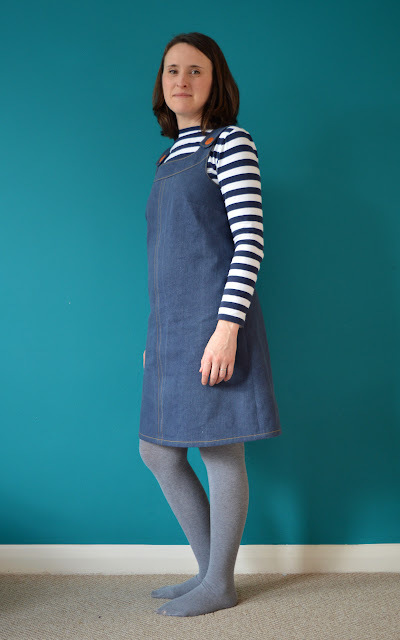 I've had my eye on Jennifer Lauren's Ivy pinafore dress pattern since she released it about 18 months ago, but I held off from buying it immediately because of the need for breast-feeding related access. I eventually I bought it at the end of last year, and shortly afterwards I realised that I already had the perfect fabric sitting right there in my stash! 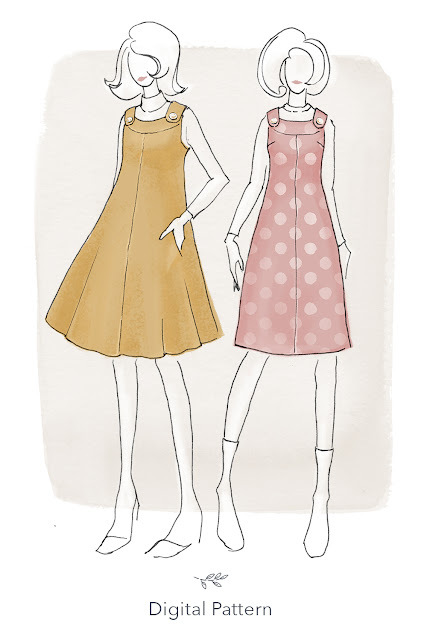 I've had my eye on Jennifer Lauren's Ivy pinafore dress pattern pretty much since she released it about 18 months ago but I held off from buying it immediately due to breast-feeding restrictions. I eventually I bought it at the end of last year and a couple of months later I realised that I already had the perfect fabric sitting in my stash! 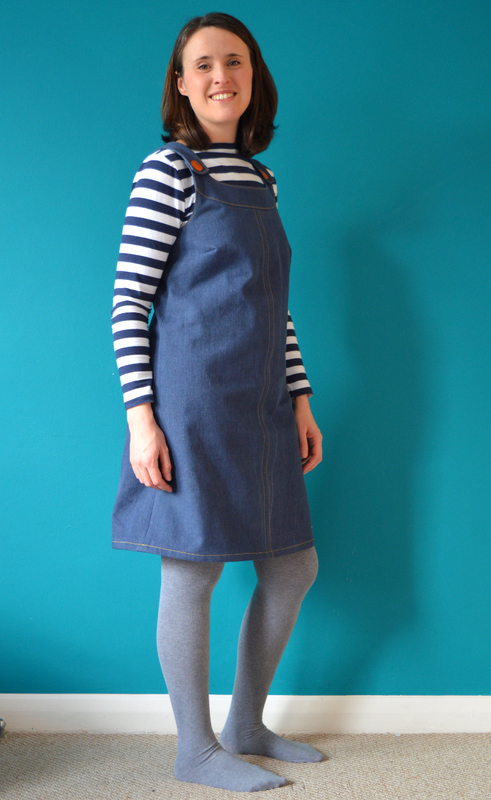 I LOVE the utilitarian vibe of a denim pinafore type garment, and Jennifer's denim version looks pure perfection to me. 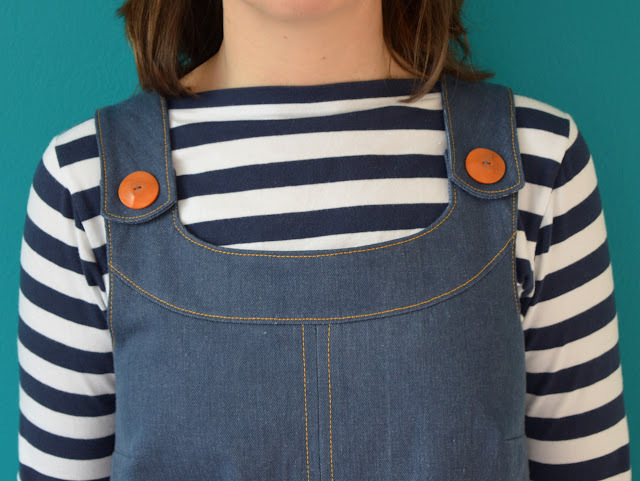 There's a lovely lady called Karen who takes her grandson to the Story time group at our local library that we go to every Monday, and she often wears an olive coloured pinafore that is really similar to this. As I've got to know her, aside from having fabulous style, I've discovered that Karen is awesome in many ways and I basically want to be her when I grow up. But back to the pattern. The pattern view I prefer is a deceptively simple looking shift dress with bust darts, slight waist shaping at the CB, and a fabulous curved yoke. It's lined so it won't stick to your tights when you walk, plus the pattern also includes in-seam pockets, which I omitted in the event that I'd need to monkey around with the fit. First up, let me say that this that this project was really fun to make. I find the process and effect of contrast topstitching to be so satisfying. That said, it's now confession time: I didn't make a toile, which is naughty! I felt that a simple pattern such as this would be fairly simple to tweak midway through the construction if need be. According to the measurements, I fell between the size 10 and 12. I erred on the side of caution and went for the larger, however it ended up way too big. I took in the side seams by about one size, but looking at these photos I think it still looks a little on the large side. I plan to remove and reattach the buttons so the straps overlap a little more. That should raise the dress a bit and hopefully get the bust darts to sit more where they belong. Of course, that would all have been avoided if I'd just made the freaking toile that I knew I should have. 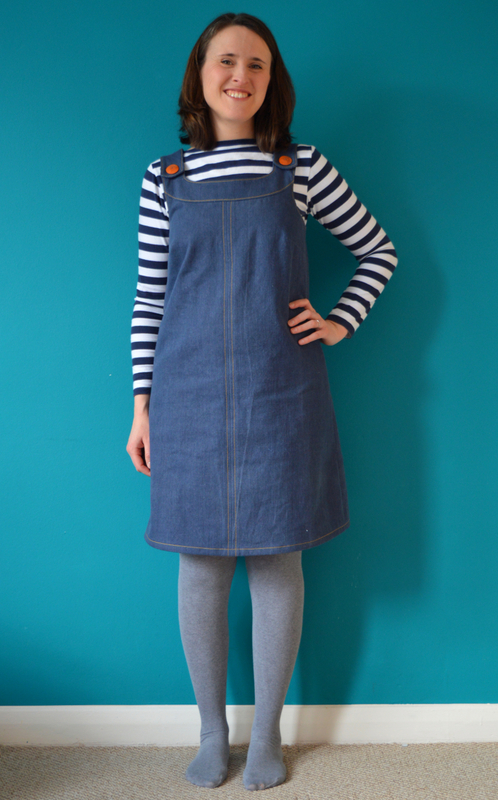 I 'rescued' this length of vintage denim from a retro/vintage furniture and homeware shop near my then-home in Hove. 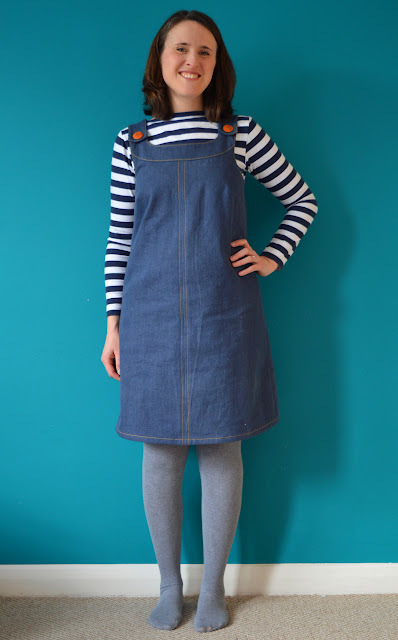 Whilst I loved this fabric immediately, the inbetween-y too-thin-for-trousers-too-thick-for-a-top-or-dress weight confused me so it has remained in my stash for about 5 years until I figure this shift pinafore was its destiny. There was about 3m of it, but it was really narrow so I more or less used it up with this project. The fabric had a pleasing white selvedge which I managed it incorporate along the CF, but because this dress is fully lined, the selvedge is sadly hidden apart from at the very bottom by the hem. I found the buttons, which I believe are also vintage, in my stash and I have absolutely no idea where they came from or how they found their way in there. But it doesn't even matter what I think about this dress because when I wore it to Story time, Karen loved it. So much so, she enquired how much such a garment would cost. Dammit! I hate having to avade a commission. But what a compliment: my muse likes it so much she'd like one for herself! Anyways, where ever I eventually fall down on this particular garment, I definitely see myself using this pattern again. Perhaps in a burgundy needle cord, but starting with the size 10. Lessons learnt. Pattern: $9.09/approx. £6.50. I bought it at a Black Friday discount, normally it's $12.99/£9.30 available here.